If You’ve Dared to Love a Dog: In Memory of Custer – Raw. Real. Reflections. If you’ve dared to love a dog, you’ve opened your heart up to a world of unconditional love that reflects God’s love for you. Just as God loves you more than all the words in the dictionary could describe, dogs are capable of reflecting a similar love that isn’t based on performance. They just love you because you’re you. Not because of your intelligence or your looks or your bank account or the way you dress. They simply love you with every fiber of their being. Because you are you. Period. My precious, sweet golden retriever, Custer, exuded life and love. She wore a smile in her heart and wagged her tail with every step. Golden retrievers are known for their gentle, sweet temperaments. Custer certainly brought smiles, love and joy with each breath. All the neighborhood kids loved her. But it’s no wonder- as she loved people deeply and they felt enormously loved in her presence. And of all those she loved, she loved me the most. She knew she had me wrapped around her paw, so to speak. I spoiled her and learned early from the vet and trainers that golden retrievers are usually spoiled because they are so gentle and loving. I’m one of those “dog people” in that spending time with Custer made my heart sing. She loved attention, and thought the universe revolved around her. But no wonder, because I treated her like a queen. She was swimming in love from me and other people as well. People were drawn to her because of her loving demeanor. Wow, what a glorious world it would be if people loved each other as Custer loved people. Truly, Custer loved well. I really sat down to write a snapshot of her life, but I’m still so raw and devastated that tears are streaming down my face as I reach into my heart for the right words. Creating canvasses with words is usually easy for me, but not this time. The depth of the loss I feel from losing Custer is monumental. Custer, you will be remembered forever. You were a beautiful treasure, wrapped in joy and reflecting God’s unconditional love. I will miss you forever. Thank you for blessing me with your love. I dared to take the risk of loving a dog, and that means I’m brave beyond words. After all, dog lovers know their pets will live relatively short lives. You poured your love from January 28, 2001 through August 1, 2013. Your paw prints are forever on my heart. Cherrie, I’m so sad for you. We had to unexpectedly put our golden Libby down over a year ago and we still miss her deeply. There’s nothing like that silly smile of our goldens, is there? Hugs, my friend. Thank you, Stacy. Yes, they are treasures. I’m so sorry you lost your sweet Libby. We put Custer down a week ago yesterday, and we saw it because of her health issues. Even so, it’s not easy. Although you can’t replace a person or an animal, I hope you find another sweet dog someday. Thank you, Krista. It’s so hard to lose our beloved pets. I hope your kitties are doing well. Cherrie, my heart breaks for you. 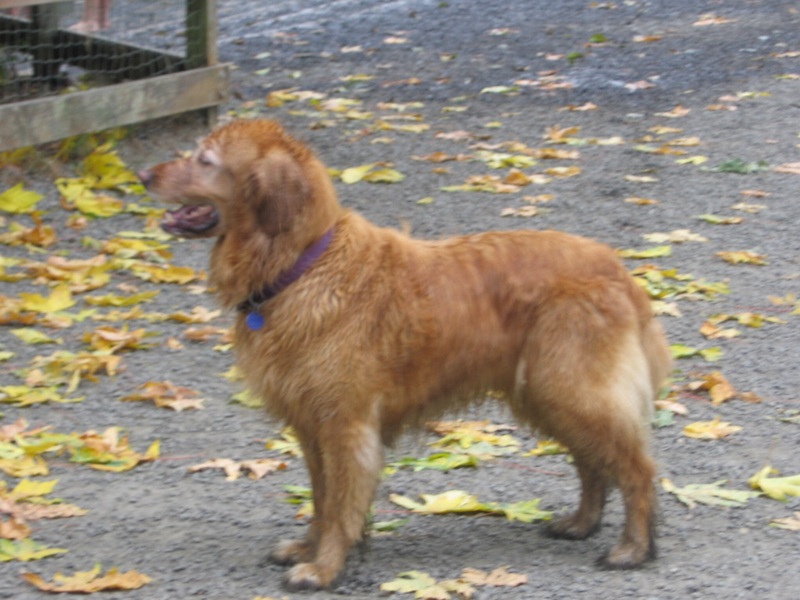 We have loved and lost 3 goldens, the most recent being our beloved Libby. There’s just nothing like the constant smile of a golden, is there? Hugs, my friend. Thank you Cherrie for posting about Custer. What a touching tribute! The love you gave will certianly be reciprocated. I do believe we will be reunited with our special animal friends in Heaven. They bring us much happiness and comfort. I know my cats do! whenever I feel a bit down they come to my rescue and bring good cheer in their own little way. Custer was a wonderful dog. I remember her with great affection. So sorry for your loss. Animals have a special place in our hearts. I was so very sorry to hear of your great loss. Hans and I are well aware of what it feels like to lose a beloved dog after being spoiled by them and their unconditional love for many years. I know Custer has provided you with many unforgettable memories which you will hold in your heart forever. Blessings to you! Thank you, Judy. I’m so sorry you lost your sweet fur baby too. 😓 It was almost four years ago. Hope you guys are well.